During medieval times, light carried mystical and symbolic meaning as it passed through stained glass windows or was reflected from the surface of gold leafed icons. During this time, illuminated manuscripts were written painstakingly on parchment by hand with gold-leafed and vividly colored miniature paintings accompanying the text. Gold itself seemed magical and represented divine radiance; in its reflected light, images were “illuminated” literally. In the Tree of Jesse from the Lambeth Bible, Jesse is seen lying at the bottom of the illumination. From his hip rises what may be interpreted as a trunk of a tree and its vine-like branches forms roundels. In the roundels at the bottom are four old prophets. Isaiah, on the left, holds the scroll of his prophesy and points upward. On the right, an old prophet also points upward as he looks toward the large central figure of Mary who is dressed in blue (the symbol of purity and heavenly grace). Branches move upward from Mary’s head to form a roundel containing a half figure of Christ; He is surrounded by seven doves that represent gifts of the Holy Spirit. 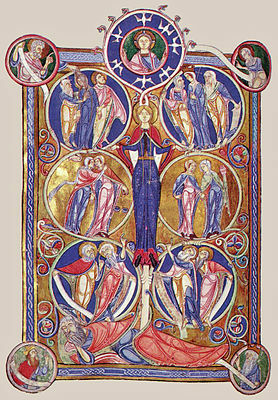 In the upper left roundel two apostles are shown with a crowned female figure that represents the triumph of the Church. At the top right, the hand of God removes a veil (symbolizing blindness) from Synagoga, a figure representing the Jewish religion; Moses, depicted with horns on his forehead, is at her side. In the two center roundels are the four virtues noted in Psalm 85:10; “Mercy and Truth are met together; Righteousness [Justice] and Peace have kissed.” At the right, Justice holds scales as she and Peace embrace following a kiss. In the left roundel, Mercy, holding a vase, is with Truth. Mercy represents the Gentiles and Truth represents the Jews; they are holding hands to indicate the unity of the Old and New Testament. Medieval describes life during the Middle Ages (from approximately 500A.D. to 1450 A.D.) The Middle Ages came after the fall of the Roman Empire and ended with the Renaissance of the fifteenth century. Illuminated Manuscript is a term used loosely today to include all miniature book illustrations of the medieval period but true illuminations are only paintings on which gold leaf (or gold dust) has been applied. Parchment is the surface used for illuminated manuscripts. It was made from calf, sheep, or goat skin. Vellum is a parchment of finer quality. Lambeth Palace has been the official London residence of the Archbishops of Canterbury since the thirteenth century. Moses Pictured with Horns is a result of a translator’s interpretation. When Moses returned from Mt. Sinai the second time with two tablets, his face was said to shine. When Jerome, the translator of the Bible into Latin in the fifth century interpreted the Hebrew verb karan, meaning to cast a glow, he took it to be the literal form of the noun keren which means horn. Henceforth, artists depicted Moses with horns. The most noted example is Michelangelo’s sculpture of Moses.